I am becoming more and more convinced that the health systems strengthening movement could learn much from the so-called “systems sciences.” Below are some resources that I have found helpful. Systems Thinking: Creative Holism for Managers is the best summary (that I am aware of) of the various systems thinking approaches and methods. Jackson considers ten: hard systems thinking, system dynamics, organizational cybernetics, complexity theory, strategic assumption surfacing and testing, interactive planning, soft systems methodology, critical systems heuristics, team syntegrity, and postmodern systems thinking. Thinking in Systems: A Primer is an excellent, easy to read introduction to systems thinking. Peter Senge’s The Fifth Discipline: The Art & Practice of the Learning Organization is a classic, best seller that outlines the five disciplines that are needed to form a successful organization in this age of complexity and rapid change: “personal mastery,” “mental models,” “shared vision,” “team learning,” and “systems thinking.” While the examples and explanations are primarily from a business perspective, the principles apply to all organizations. Here is a brief blog post that summarizes the evolution of systems thinking. I have found this lecture series on complexity by Scott Page very helpful. Finally, this blog post lists the top 15 systems thinking books, and this blog lists their 10 favorite systems thinking books in the last decade. Here is a brief systems thinking introduction provided by the Association of Schools of Public Health. This 2007 Symposium on the Systems Sciences sponsored by the NIH provides great introductory lectures to 3 methodologies: systems dynamics, agent-based modeling, and systems network analysis. This is an excellent consideration of healthcare as a complex, adaptive system by William Rouse from a US health system perspective. 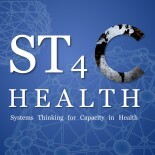 This document (about 100 pages) approaches health systems strengthening from a systems thinking perspective. It is published by the WHO’s Alliance for Health Policy and Systems Research. Here is a 6 min summary video. There have also been a number of excellent articles on complexity and health care by Paul Plsek. See here, for example. Allan Best has also published extensively on the subject. See here, for example. Are there any other systems thinking resources that you have found helpful? This entry was posted on March 13, 2011 by chads in Uncategorized.